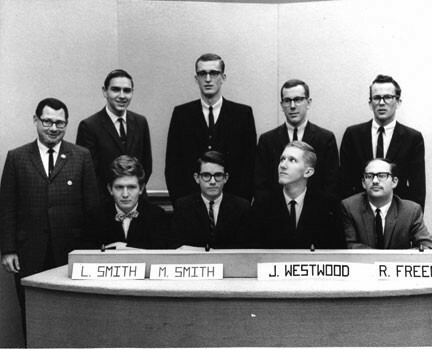 In a February 11, 2004 post on my Joe's School weblog about the State Board of Higher Education, I talked about the record breaking performance of Portland State's College Bowl team during my freshman year there (1964-65), and the frenzied response of not only the school but the entire state to the team's shocking success . Here's a picture of the team, courtesy of the Daily Vanguard. Click here to read the accompanying article.